Just received notice of this interesting exhibition in Boulder, Colorado, from its curator, Ross Etherton, a PhD student at the University of Colorado Boulder. 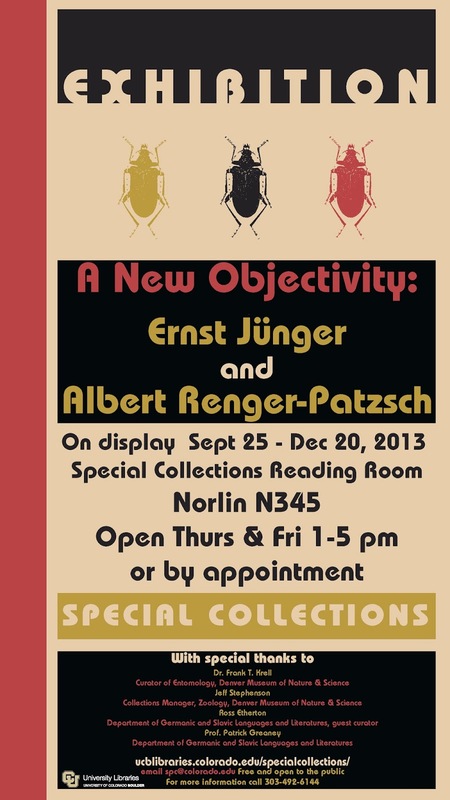 His exhibit showcases many early copies of Jünger's works, most of which once belonged to Gerhard Loose (one of Jünger's biographers), as well as some hand-labeled beetles that belonged to Jünger (on loan from Dr. Frank Krell from the Denver Museum of Nature and Science, who met Jünger in the 1980s). The exhibit also features early copies of Renger-Patzsch's books, as well as Bäume und Gestein. Although already open to the public, the official opening ceremony is on Monday Oct 14. The Forest Passage - coming soon in English!